How many times have you wished that a stupendous work of art was adorning your empty office wall? Something to draw the admiration of your clients and envy of your colleagues in equal measure. How many times have you come back home tired from office and wished that you could relax beside the soothing light of an alluring lamp shade graving your center table? Your wait is finally about to end. 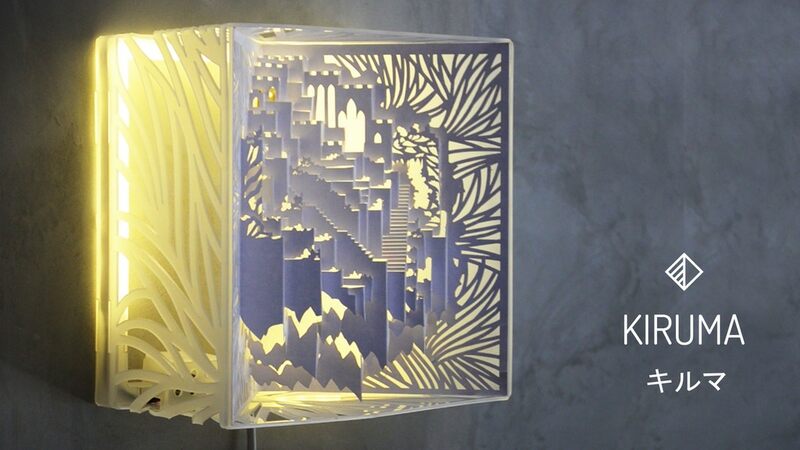 Presenting to you KIRUMA – illuminated Kirigami lamp of a castle in the sky. 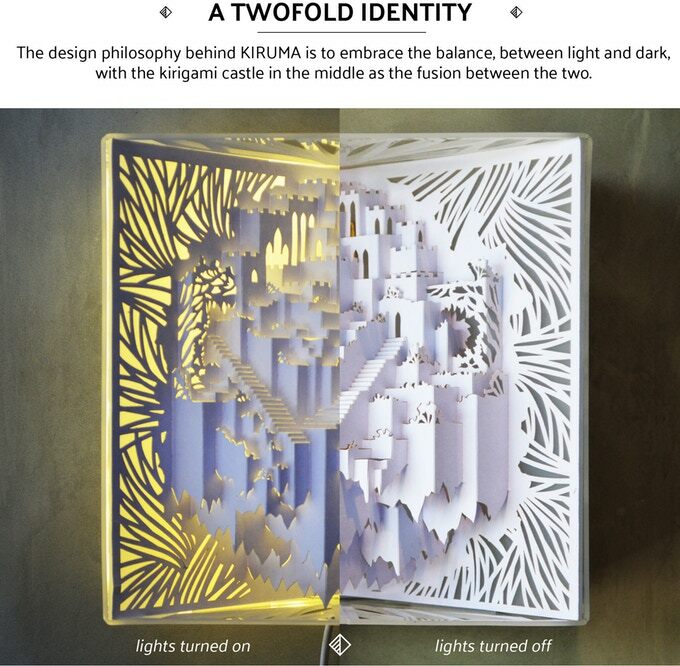 Kiruma is essentially a Kirigami lamp but its similarity with the run of mill lamp shades ends there. Owning it would give you immense pride as it is truly an original and unique art work. It comes in four variants – Kiruma Digital, Essential, Basic and Classic. The Digital variant gives you high-resolution photographs of Kiruma in contrasting lit and unlit state. The real thing begins from the Kiruma Essential which gives you a wall mountable pop-up diorama in hinged acrylic boards. It essentially captures the soul of the Kirigami. An upgrade on the Essential variant is the Kiruma Basic which is the fully assembled, wall mountable version but without the integrated lighting set up. The top variant is the Kiruma Classic and it comes with all the bells and whistles. It is the fully assembled, wall mountable version with integrated lighting. All you need to do is simply to plug-in to enjoy the mesmerizing play of light and shadow. Original artwork cut with laser precision– The design of the product has gone through a lot of trials before being finalized. 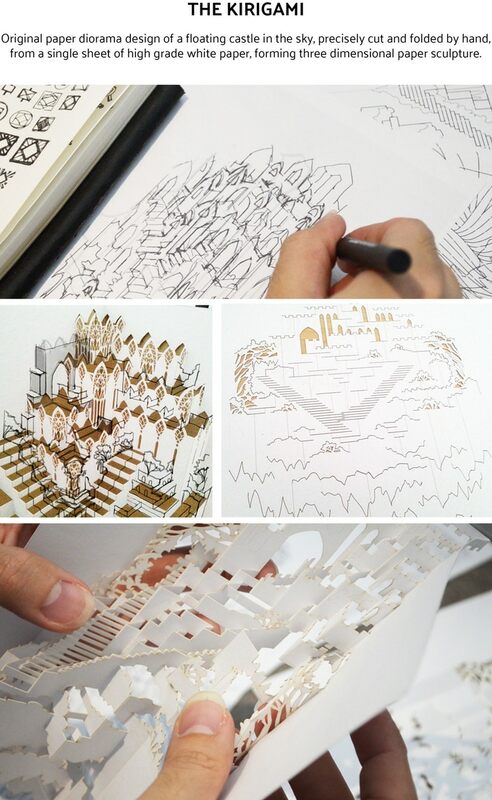 The diorama of the castle floating in the sky is breath-taking and the flawlessness is imparted by laser cutting of both the paper and the acrylic. Handmade and Unique – The folding, assembling and the finishing of the product are done by hand. This human-touch makes your KIRUMA unique even among the same variant. It gives you pieces of personal touch which catapult it far beyond its machine-made competitors — Someone, somewhere in the Far East has taken care of my Kiruma by his own hands. Isn’t it thrilling to feel so? Acrylic Frame Box and Acrylic Wall Hanger – This may seem like a sedate feature making you wonder what’s so special about it but make no mistake. 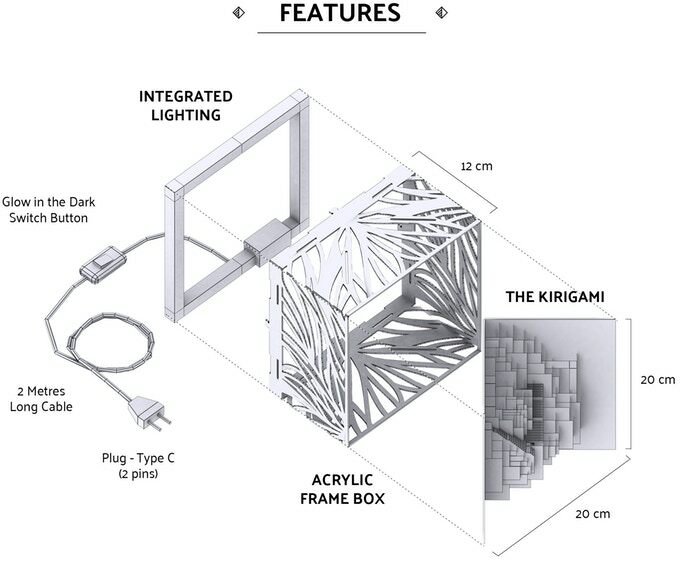 The laser cut, acrylic frame box gives Kiruma its versatility. Because of the frame box, Kiruma can serve both as a centerpiece on a table or a wall hanging the lamp. On top of that, it also houses the lighting set up. The acrylic wall hanger brings more natural joy — No need for hammer and nails, to keep your walls clean and happy. Integrated Lighting Set Up – The feature that takes the cake is the high-output low-energy warm white LED lights available in Kiruma Classic. The color of the light is thought of incredibly well. It does not only complement the stark white paper beautifully but also the interplay between the light and shadow thus formed leaves enough to the viewer’s imagination regarding the grandeur of the work. On top of that, all the electrical components are nicely camouflaged as they are finished in minimalist white and blend with the acrylic frame box. Shipping cost — As the product comes from Indonesia, shipping cost to the US or Europe countries may burn a hole in your wallet. Limited use due to contrast issues — The while paper of the Kiruma hanging from a white wall during daytime is a no-show. If you are planning to buy the Essential or Basic variant, you must think about where to place it beforehand. Extreme fragility — Needlessly to say but Kiruma is extremely fragile, please think twice if you have babies or toddlers at home. You don’t want a work of art modified by junior genius, do you? 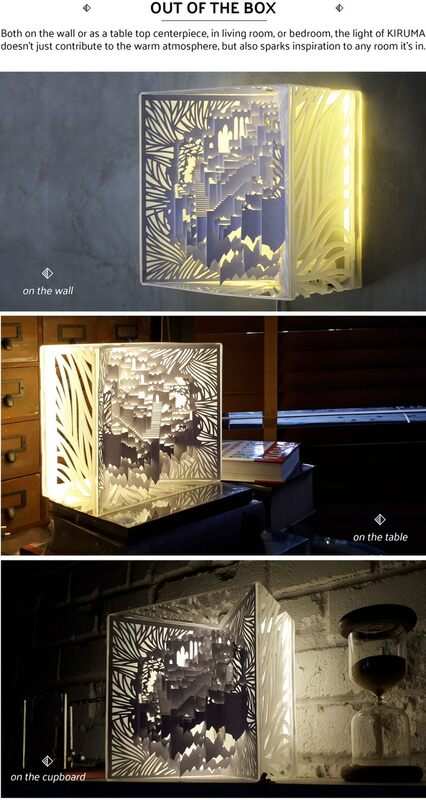 Competition — Kirigami lamp is not a new product. If you like the product but stopped by the price tag, check Amazon (on our homepage) for alternatives. Kiruma is now available on Kickstarter starts at $50. Grab the time-limited perks while you still can, to enjoy up to 10% off future retail price. Check the link below for latest available price.